Nearly twenty years ago, a teenage climber sat on a ledge overlooking a gorge in the Pir Panjal mountains. He saw a couple of Bharal grazing on the cliff face across the gorge. The sun was low, the weather crisp and a hot meal waited back at the camp. All was well with the world, when hell broke loose. The Bharal started running helter skelter, dislodging rocks and diving to lower ledges. In a cloud of dust, what he thought was a rock had transformed into a creature with long bushy tail, going after the Bharal at full tilt. Sadly, he missed and the Bharal escaped with their lives. The creature gave up his quest, turned around as if to look at the climber, and disappeared. The teenager had seen a snow leopard on a hunt. Delirious, he ran back to camp and narrated the event to his mates and guides. They scoffed at him – snow leopards don’t just turn up, and certainly there were none in these parts. No one that day believed him, nor did anyone in the years to come. The teenager had no photo to prove himself. So he shut up. And vowed to document his travels from there on – and take a photograph of a snow leopard one day. Cue to 2017 and furious debates were raging in bars, Whatsapp Groups and living rooms. Which spot was the best bet to capture a snow leopard in its element? Ladakh – home to the epic sequence shot by the BBC Planet Earth 2 team? Or Spiti, another place where snow leopards had been documented? Or do we head back to the deep valleys of Pir Panjal, where the chance encounter had taken place? Conventional wisdom suggested Ladakh, for access was easy even in winter. And there existed professional teams of guides and tour operators, running well drilled trips with success. But my heart was set on Spiti. 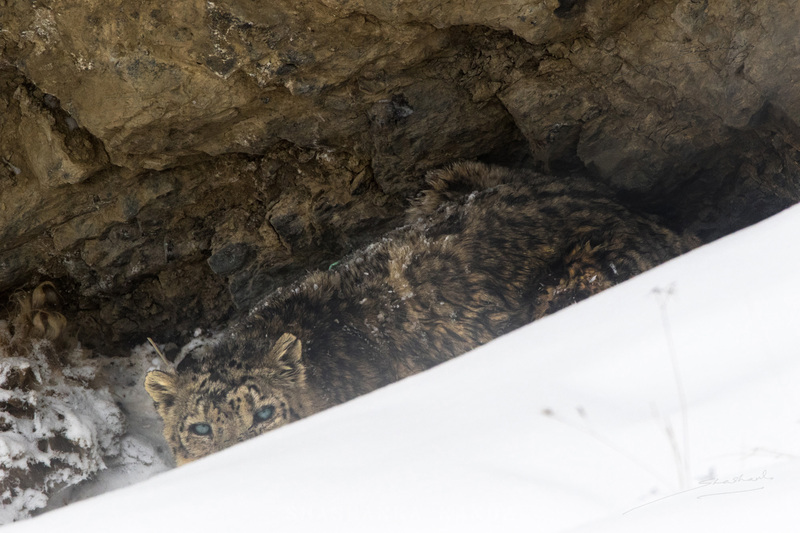 For one night while camping under the shadow of the Chau Chau Kang Nilda, I had heard the mournful calls of a snow leopard looking for a mate. Calls, that had rekindled the long forgotten dream. The winter of 2017-18 had been the worst in living memory for Spitians. It had barely snowed up until then, and the locals were bracing for a summer plagued with water shortage and meagre harvest. It would also make spotting a snow leopard difficult – what with its brilliant camouflage and no tracks to show up on bare rock. But it seemed that our arrival in the upper reaches of Spiti had triggered a change in the weather. Crisp blue skies gave way to a blanket of white, and it was impossible to discern the mountain from the sky. And then snow fell overnight and the next day. Good news for the locals – and for us. Having spent nearly 36 hours hemmed indoors, we grew restless. Weather be damned, we had to be out. So we trekked down to a gorge, where some Ibex had been spotted by our guides earlier in the morning. For there are only two ways to find a snow leopard – follow herds of prey like Bharal and Ibex and look for signs of a leopard. Or follow tracks in snow, if you chance upon any. The fresh snow and presence of Ibex was our best bet. As we were photographing the herd on a cliff, Dorje our guide had his eyes on the other side of the valley. Sudden movement, and the sound of barking dogs from the village side alerted us. We hurriedly packed and started following the commotion. An hour’s walk through snow brought us to another gorge. Another pair of local guides were already there, and they were pointing down. There, in a crevice with the carcass of a sheep, was the snow leopard. The cameras were set up, shutters were pressed. And then blue eyes looked up straight into ours. And we cried.